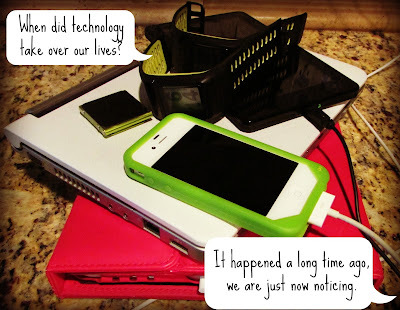 RUNNING WITH OLLIE: Thank You Technology: How Has Technology Enhanced Your Life? Thank You Technology: How Has Technology Enhanced Your Life? The other day I looked at all the gadgets charging on the counter, fighting for outlet space. 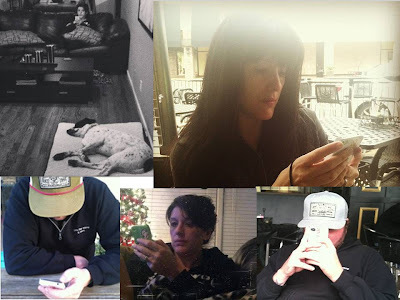 I asked my husband, "When did technology take over our lives?" "It happened a long time ago, we are just now noticing." Do you ever text your spouse from the living room and ask him to bring you a drink? Or text him from the other side of the couch, just to say hi (or I love you)? Or Skype each other from different rooms in the same house? Or find out about your husband's lunch plans or his latest speeding ticket (aurgh!) from his Facebook post? It can't be just me. Technology has taken over our lives. But it is not a bad thing. Technology makes our lives easier, closes the distance gap, and provides us more information at our fingertips than we could ever have imagined. I say as long as we avoid a few technology faux pas (like texting while driving or ignoring your guests at a party to stare at Facebook), then we should embrace it with open arms. Facebook has brought me back in touch with so many old friends. How else would I find my best friend from elementary school, or see my old college boyfriend's twin daughters? Or stalk my husband's ex-girlfriend from 20 years ago (kidding!). I can watch my friend's kids grow up from across the country, and cheer for them on their first day of school. I can reminisce with old classmates about that teacher (we can't remember his name) and laugh about how old we became. Most of all, Facebook allows me to have a daily peak into my friend's lives who live far away. I credit social media for allowing me to stay in close touch with distant friends and family. Through their posts, even when we don't always directly communicate, I have a connection with them. I can watch the highlight reel of their lives. Thank you technology. Don't even get me started on how technology enhances my running. Between running playlists that fit into a 1"x1" iPod, my GPS watch, a million running and fitness apps, and online running communities, I can't even imagine my running world without these things. Sure, all you need to start running is a good pair of running shoes, but my music, my GPS feedback, my running apps, and my online running friends make it all so much more enjoyable, and keeps me motivated. Thank you technology. I mentioned already how technology enhances my running with music, but to even a greater extent, technology enhances my life with music. I am sort of a music fanatic. In my real life, I struggle to find more than a single person who has the same passion for my favorite artist that I do. So what does a girl do? She joins groups and online communities of like-minded people and discovered there are hundreds (if not more) people just like her. I found these kindred spirits online, we likely do not have much in common other than our passionate love of music, and that is all we need. 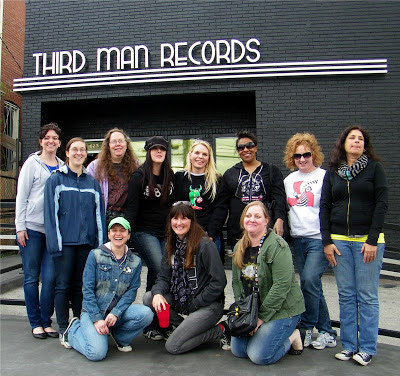 I never imagined that because of modern technology, a social introvert like me, would make a solo trip to Nashville to meet with up with my fellow online Third Man Records fans. 10 years ago, something like this would not have even been possible. Thank you technology. Online friends become real friends. You are probably already sick of me talking about it by now, but I am studying for my personal training certification through NASM. The last time I was a serious student was in the 90s, so it is an understatement to say that technology has progressed a lot since those days. First of all, I am taking an online class called eTeach to help me pass the certification exam. Learning muscles is sort of less hellish fun with an interactive muscles app, and memorizing data is convenient with a flashcard app. Then, who knew, you can study your flashcards in a scientifically-based learning environment with a really cool app called Brainscape. It's science B**** (that is funny if you watch Breaking Bad). Thank you technology. I love my blog. Is that weird? I mean, I really love it. It is my baby. I work so hard at it, but it is a labor of love. Sometimes it consumes my every free minute, but all of the writing, the editing, the picture taking, the promoting, and connecting online is my creative outlet, my personal expression, and my passion. Without technology, there would be no blogs. Without my Facebook fan page, my Twitter account, my Instragram account, and my Pinterest boards, I wouldn't have the kind of connection that I do with my readers and other bloggers. I wouldn't have been able to watch my blog grow faster than I could ever have imagined. I am routinely blown-away by the loving support I receive from virtual strangers in this online world. I am continually and utterly inspired and impressed by the Fitfluential community online. As a Fitfluential ambassador I have the support of hundreds of other health and fitness bloggers. I am presented opportunities that are beyond my dreams. Under Armour, what? Fitfluential is a great community of like-minded bloggers and fitness-enthusiasts, it provides tremendous opportunities, knowledge, support, and friendships. My blog would not be where it is today without them. 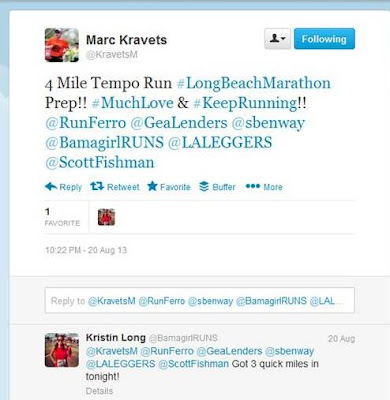 Thank you technology and Fitfluential. How about you? I'd love it if you would tell me in the comments how technology has enhanced your life or tell me on Twitter by tagging @gealenders and #fftech. Love this!! Technology has definitely enhanced my running for sure and I love my blog too :) Even if no one ever reads it, it's a labor of love and a form of expression for me! Without Skype I would never want to take business trips. As a mom being able to Skype with the kids makes me feel connected, Facebook helped me recover from Post partum depression, and blogging has allowed me to pursue a passion for writing! My husband works from home, so sometimes I like to text him from another room and say "made you look"! I know, very mature! Ha! Since I switched from a Blackberry to an iPhone, I find myself on my phone a whole lot more. I think I have four running apps on my phone right now, and I use Hootsuite to manage my Twitter and Facebook accounts. We live about two hours from our families, so Facebook has been a great way to keep in touch with them. I agree, but sometimes I feel like I don't want technology to have a hold of me anymore! Like anything, it's a balance. I certainly love technology but can be overloaded too. I avoided a smartphone for YEARS! I finally caved and sometimes think it might be nicer without it! I couldn't do without my iPhone most of the time, but my husband and I make a point to leave our phones in the car on date night! Nothing drives me nuts more than sharing a meal with someone while they spend 90% of the time looking at their phone screen!